The 650 in the X2 was getting exhaust gasses in the water and wouldn't hold any kind of pressure when I blocked off the exhaust manifold and intake manifold. So I had the head resurfaced and bought new O-rings and have a couple of questions before I assemble it. $60 to have both re-surfaced. The head had a 0.015 inch twist but is now flat. 1. The O-rings in the photo are new and are good to 250 degrees Farenheit. They are not Viton. They are 90 durometer. I purchased them at Fluid Tech which is a local industrial (I mean massive 16" dia. 12' long actuators with 8' throws) hydraulics shop. Anyway this is the best they had. Are they the right material, softness and heat range? McMaster-Car has a whole bunch of 042 O-rings of varying softness including Viton and silicone which are good to 400 or 450F. Should I order two of these instead? 2. Should I put some Threeond 1211 or Yamabond 4 or some other sealer on the aluminum around the water jackets? 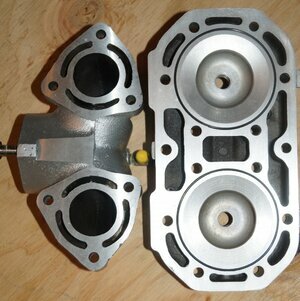 I have the oem Kawasaki Jet Ski X-2 Waterccraft Service Manual, but the stock head uses a gasket not o-rings, so it is not helpful on this topic. I asked over at pwctoday, but have not received a response. You need to use Viton o rings! Even those eventually burn thru- but you'd get a decent service life out of them, compared to others. In this static application a durometer of less than 90 would be preferred. Thank you @augustaf ! How about these? Yes. 1211 the water jacket. Thanks Harbor ! What do you think about the O-rings? I would wait till augustaf has a look at the Vitrons you found..
Those Fluoroelastomer Vitons work just the same- are probably brown in color. Make sure cylinder deck and head surface is well degreased before applying the 1211 to seal the water area. Thanks augustaf ! I ordered the O-rings and will acetone the surfaces before applying Threebond 1211. E350, what guidelines did you use to design your O-ring grooves? An O-ring head use o-rings that float in the groove. 1- When you use 1211/sealant on a O-ring it turns it into a gasket. 2- When you use grease on a O-ring it is a seal. 3- Use the manufacturers specs for groove/seat design. 4- Quad O-rings (X pattern) work better than round O-rings for dynamic applications. The O-ring grooves were designed in ~1988 by engine builder Eric Burton. I have no idea (and given the passage of time, I doubt Eric has any idea) what guidelines were used to design the O-ring grooves. I would love to read and consider O-ring groove guidelines if you could provide a link or a pdf or other info. I will order the next smallest and next largest O-rings and compare. I will tell you this, however, the O-rings which I currently have, definitely do not "float" in the groove. They are a little small in my opinion. Meaning that I have to stretch them over to get them to fit into the groove. 1- When you use 1211/sealant on a O-ring it turns it into a gasket. Should I do this or not. I.e., is this good or bad? 2- When you use grease on a O-ring it is a seal. Should I do this or not. I.e., is this good or bad? 3- Use the manufacturers specs for groove/seat design. Not an OEM design, per my response to wmazz above. 4- Quad O-rings (X pattern) work better than round O-rings for dynamic applications. Is my particular application a dynamic or a static O-ring application? I saw X profile O-rings as an option at Master-Carr. Should I order and use them? Here's the most important part: THANK YOU BOTH !! I once had a conversation with the President of ADA Racing, Brooks about sealant vs grease on o-rings. It was his strong opinion to use grease because sealants can change the critical tolerances for the o-ring in the groove. E350, The re-conditioning of the 650 head you have looks good. If you had 0.015" removed (at least) to make it flat again, The o-ring groove should have also been touched up to the proper depth (hope so). If not, the o-ring won't fit properly and interfere with the metal to metal contact as designed, (head to deck). I can't imagine that would last very long. Besides that, you bumped up the compression a little. On ADA and similar "dome shell" style heads, you can see after a season or so the "wear" marks on the top of the domes where the dome meets the actual head shell. It's a very little movement, a thousandth's or so, but enough to create a visual pattern. So if things are moving around up top there, there has to be similar movement (probably more) where the dome face meets the top of the cast iron sleeve. A good synthetic or teflon based grease is probably the best thing to use there (to allow for movement and retain the seal). Also, the surface finish on top of the sleeve where the o-ring seats should be smooth, not rough, (240 grit or finer finish). If the o-rings are still not lasting long, besides having warpage or mis-matched parts, detonation can create additional issues that will help make them leak.